Welcome to the Cancer Club! It’s a very special club, because it’s the only club nobody wants to be a member of—and that includes me! My name is Bridget, and I am a breast cancer survivor. I will never forget just how strange it is, how frightening, when you are in the process of being diagnosed. As you wait for the biopsy results, your mind is going in 100 different directions. You want to be able to do something but, you are powerless. For me, those days of waiting were truly crippling. All the unknowns! Will I test positive? Will I have to have surgery? Will I have to go through chemo and radiation? Will I lose my hair? And inevitably, will I survive to see my beautiful boy become a grown man with a family of his own? When my surgeon said that my biopsy was positive, I was floored! It was as if someone had just dropped a load of bricks on me. I couldn't breathe. I felt like I was trapped in a bad dream. I wanted to run away, to somehow prove to myself that this was not happening. You try and prepare yourself for the worst and hope for the best, but you are never really prepared when your Doctor tells you that you have cancer. Certainly I never expected to be facing my own mortality at age 33!Once the initial shock fades, you have to somehow brush yourself off and summon the warrior that is within us all. You surround yourself with great doctors, a great support system--be it family or friends--and laughter, because we all know that laughter truly is the best medicine. And then, you have to get ready for battle. Believe it or not you will learn to laugh again. You will get through this. How? By taking it step by step, one day at a time. Remember that knowledge is power. The more knowledgeable you are about your disease and the treatments that are offered, the more equipped you are to make the best decision possible. A wonderful nurse once told me never to look back and say “should have, would have, could have.” You simply make the best decision possible with the information you are given at the time, and you can never look back. Know that my heart goes out to you, because nobody should have to battle this disease. Know also that you are never alone. Many have walked and are walking in your footsteps. Remember to take one day at a time, to fight like hell and to never give up. 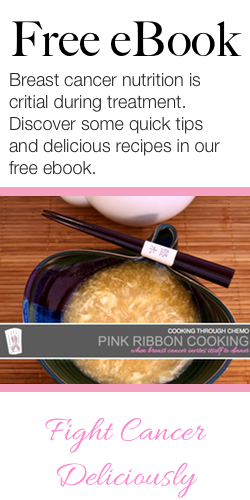 If you are newly diagnosed, looking to take control or are caring for a loved one in treatment, please accept our free eBook Cooking Through Chemo.